[C]aR – Chapter 2 – [Manga] pt. 1 | What is Manga? No one knows exactly when the first Japanese tried his or her hand at cartooning, or why, but it was probably with a playful, irrepressible spirit. Frederik L. Schodt, Manga! Manga! 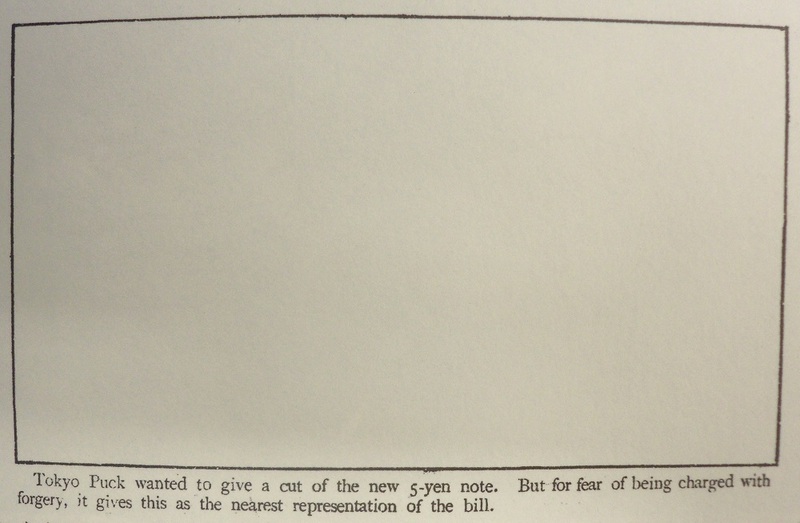 In 1921, Okamoto Ippei, along with 17 other members of the Tōkyō mangakai (Tokyo Cartoonists Association)—some well known (e.g. Shimokawa Hekoten, Ogawa Jihei, Yamada Minoru) and others much less so—produced a rather curious object: a pair of illustrated handscrolls in a wooden box with a perfume packet labeled hana (“flowers”) titled Tōkaidō gojūsantsugi manga emaki (53 Stations of the Tōkaidō [Manga] Handscroll). The title of this thing, to use the most obnoxiously generic term possible, copies of which went on sale in May of that year, is revealing in how it tries to conjoin at least three distinct things: [manga], illustrated handscrolls (emaki), and the waystations of the Tōkaidō, the coastal road running from Edo (modern day Tokyo) to Kyoto, a common artistic motif in the print culture of the late Edo period (i.e. 17th – mid 19th century). A cursory examination of this object might make of it an obvious example of an artistic tradition running from the earliest forms of Japanese textual illustration to contemporary [manga]. Certainly, to the untrained eye, it might appear to pose a continuity with earlier artistic forms, but upon close inspection and consideration of the material and cultural conditions of these earlier forms, it becomes clear that this object in fact represents a (likely intended) distortion of the traditions of Japanese art. Most importantly, emaki and nishiki-e (literally “brocade pictures,” i.e. multi-colored woodblock prints) have little to do with each other both formally and historically. Illustrated handscrolls are much older and most closely associated with the Heian period (8th – 12th century), the four most well known emaki all having been created in the 12th century. They are singular objects, drawn/written/painted by hand, typically in ink, by artists whose names are almost never recorded. Their image/texts are generally continuous, and sections are framed far less by any material feature of the text than by the common practice of unraveling an arms length of the text and then proceeding through it by unraveling the scroll with the left hand while rolling it back up with the right. Woodblock prints, on the other hand, are a creature of pre-modern Japanese print culture: mass produced, with print runs made from existing blocks well after the artist has died; generally identified with particular artists (e.g. Masanobu, Hokusai, Hiroshige, etc. ), even though much of the actual work was done by assistants; and sold either as individual prints or bound in handsewn codices. Emaki come from a court culture of nobles and the Imperial household, when the handcopying of texts, sutras in particular, was an important meditative practice, whereas nishiki-e come from a society ruled by a military dictatorship with a rigid caste structure (warriors, farmers, craftsmen, merchants) in which artists’ prints were a commercial commodity circulated among what then would have been the lowest rungs of society and in which the use of money was considered unseemly. The mangakai’s emaki is also a creature of print culture, despite not being, in fact, printed at all, a fact that makes it remarkably distinct from the milieux in which historical illustrated handscrolls and woodblock prints emerged. The scrolls of the manga emaki are made up of individual watercolors, which are mounted on a long silk backing. 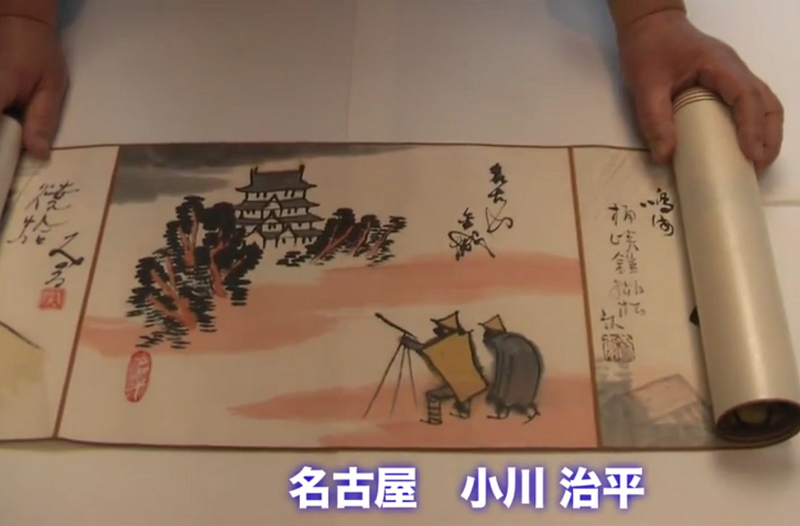 All artists are clearly identified, and each image is framed by the dimensions of the paper sheet on which it is printed and not by the common practices of reading/viewing emaki. More importantly, the images themselves demonstrate a clear theme of juxtaposing the old with the new: modern geographic names are used instead of the pre-modern ones (e.g. Edo is now Tokyo, and Yoshida is now Toyohashi) and figures in modern dress can be seen moving about ancient locales riding bicycles and driving cars. 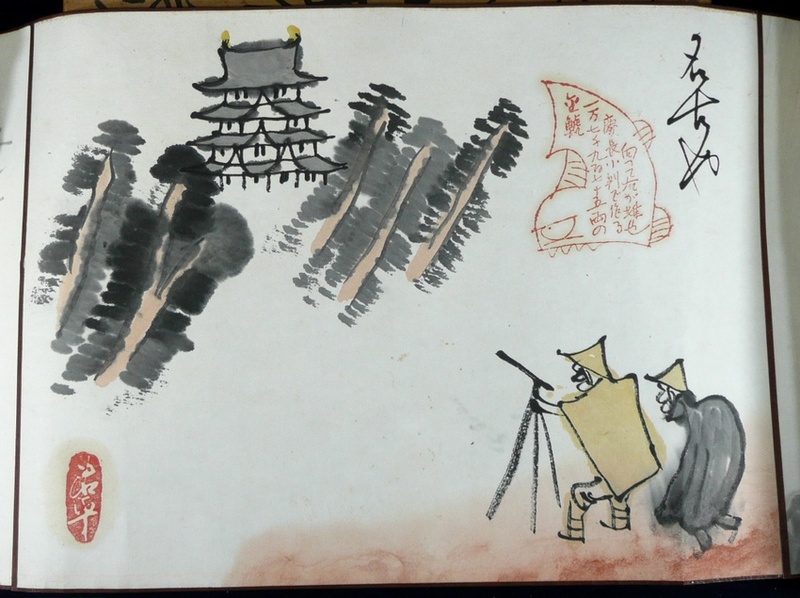 Jihei’s “Nagoya” shows two tourists in typical Edo period straw hats and traveling cloaks looking up through a telescope at the kinshachi on the peak of the roof of Nagoya Castle. This image is particularly revealing for how it makes clear the scrolls’ function as a kind of optical device by which the old is seen through the new, distorted—by which a new art form—here only apprehensively called [manga]—appropriates the old. The fact that older artistic forms are represented not quite correctly in this manga emaki seems to be not an accident but a key feature, for the handscrolls play to a stereotype and not a reality of pre-modern Japanese art and thereby hold an easy identification with them at arm’s length. I have so far ignored the question of [manga] itself, both as term and conception of form. The term which is now ubiquitous in Japanese and more or less exclusive of other contenders only came into its current status by degrees, and since the discursive landscape of Japanese [comic] art has contracted over time, it is worth examining in greater detail precisely what happened and what terms/concepts were eliminated—or perhaps, to put it more provocatively, invisibilized. Miyamoto Hirohito has demonstrated how the term manga came to be used over ponchi or ponchi-e, which, in reference to the British humor magazine Punch, were a variety of satirical woodcut print images that relied on exaggerated caricatures and intricate wordplay often in verse, typically associated with artists such as Kobayashi Kiyochika and the magazine Maru-maru chinbun. Ron Stewart, beginning from Miyamoto, has demonstrated how Kitazawa Rakuten in particular, admittedly later in his career, understood manga as not just a development from but a reaction against ponchi. This Euro-American, universal sense of [manga] is perfectly in line with Rakuten’s senior colleague at the newspaper Jiji shinpō Imaizumi Ippyō’s repurposing of the word to translate the French caricature. 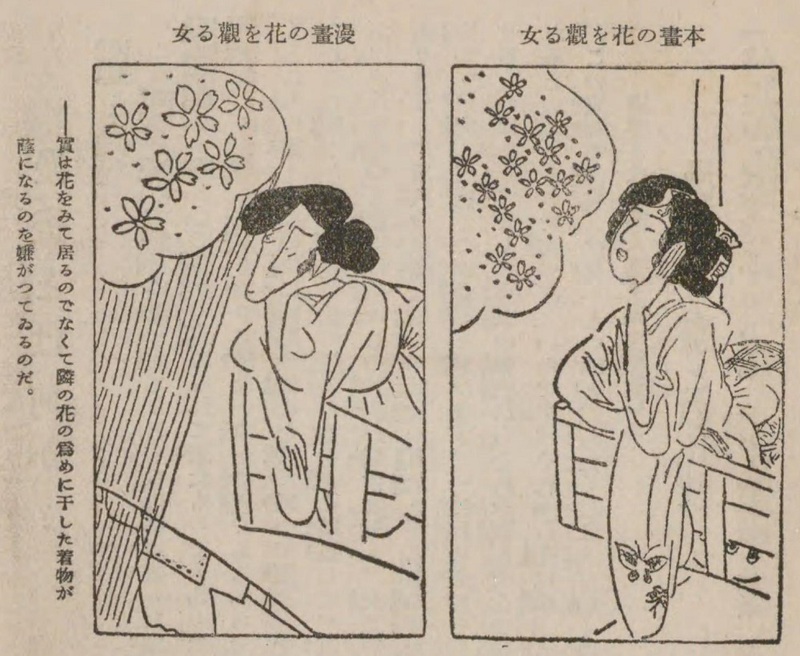 This use of the word manga is a reminder of the transnational connectedness of satirical images in the 19th and early 20th centuries, not just stylistically but discursively as well. Punch, for instance, was subtitled “The London Charivari” and modeled on the French newspaper created by Charles Philipon, Le Charivari. Punch spawned numerous imitators throughout the world, and Rakuten’s own first venture as editor, Tokyo Puck, was modeled on the American humor magazine Puck. Rakuten began his career as an illustrator for E.V. Thorn’s The Illustrated Weekly Box of Curios, a trade periodical published in Yokohama, before moving to Fukuzawa Yukichi’s newspaper Jiji shinpō in 1895. I have argued elsewhere that Rakuten’s work is clearly indicative of a treaty port ethos, and his having worked for a foreign owned publication in Yokohama as well as his use of [manga] in a less Japanese-specific sense would fall perfectly in line with that fact. Following Commodore Perry’s “opening” of Japan (at gunpoint) to foreign trade, an extraterritorial zone was established in what is now the city of Yokohama. That area, then, in the latter half of the 19th century, before the Japanese renegotiated their treaty with the British in 1899, was a hub for both trade and tourism in East Asia. Numerous foreign publications sprang up in Yokohama, including humor magazines such as Wirgman’s Japan Punch and Georges Bigot’s Tôbaé. Though Rakuten’s own work does not precisely resemble those publications, there are whiffs of that briefly cosmopolitan island within an island. 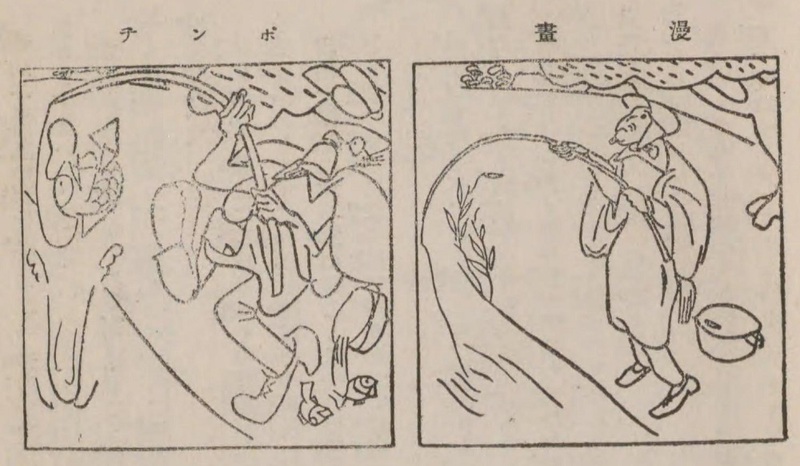 In 1902, Rakuten took over illustrating the Jiji manga page from the ailing Ippyō, and one of the first things he produced were called ponchi shashin (“punch photographs”), a kind of cartoon satirical [photograph]. To the untrained eye, these photos might not look like much, but the shape, size, the cursive font, and even the slight curling clearly evoke the carte-de-visite photographs that were sold to foreign tourists (and eventually to Japanese tourists as well) in the 19th century. Moreover, the three languages used in Tokyo Puck—Japanese, English, and Chinese—were not only the languages of the three largest populations in Yokohama but also amenable to those locations in the postal union where it was distributed: for instance, the treaty ports in China as well as the mixed immigrant communities of cities such as San Francisco. Ippei as well, in his Shin manga no kakikata (How to Draw the New [Manga]), makes a similar distinction between [manga] and ponchi-e, where the latter is overly marked by exaggeration of figures, while [manga] appears at first glance to be more “reserved” in how it depicts the human figure. However, Ippei’s juxtaposition of [manga] with ponchi is just one of a number of points of comparison: with literature, with lifestyle, with printing methods, etc. His first point of comparison, with honga or original works of art intended for gallery exhibition, is rather more telling for all the overlaps and points of distinction Ippei identifies before getting into the meat of his text, how to draw that particular form of lined art called [manga]. By way of example, he presents us with a honga and [manga] take on the same concept, a young woman looking out over a balustrade at the low-lying flowers on a nearby tree. In the image on the right, we see his example of honga, wherein, at the risk of plagiarizing myself, everything points towards its bi or beauty, though not without a touch of simple-minded “prettiness.” The image on the left, though seemingly distorted, has a far greater emotional range, and he gets at this range not by stating it explicitly but by asking a series of questions: “in the [manga], is the woman opposite those flowers feeling overly sentimental, or perhaps she is overwhelmed with indifference…” [Manga], then, is a kind of image susceptible to multiple, contradictory readings, because it is closely tied to the complexities of human affairs. A honga, on the other hand, because it is merely extrapolated from human life, over a lengthy artistic/editorial process, strikes one as emotionally and semiotically flat, even if sublime and beautiful. Ippei claims that the [manga] take on “woman viewing flowers” is more actual (jitsujō), while the honga take would be more ideal. Taken in isolation, one might read this juxtaposition as pointing to a large degree of overlap with the distinction between ponchi and [manga], at least as Ippei sees it. However, when paired with Ippei’s juxtaposition of [manga] with ponchi, a clearer triangulation begins to emerge wherein [manga] might be understood as the most grounded form of illustration and both honga and ponchi as analogous, even if different, forms of illustrative exaggeration. To understand how Ippei’s own images could appear, to use a word reluctantly, cartoonish and yet be more actual, we should turn to Ippei’s own brief but enlightening definition of [manga] at the outset of How to Draw the New Manga. For Ippei, [manga] is composed of “image[s] where one freely observes and freely depicts,” and that this mode of observation/depiction takes precedence of concerns of form (hyōgenhō) or intention (shisō). [Manga], then, is not just any kind of reading or interpretation but a promiscuous one in which an artist-writer-reader takes in the world at her leisure and willfully re-presents it in such a manner as is therein a tendency to undermine any fixity in the understanding of that world. There is an important nondistinction in classical Japanese between artist modes we might otherwise consider distinct practices. Writing, painting, and drawing all would have used the verb kaku, due to how all three were done with the same instrument, the brush. Writing and painting in modern Japanese are now written using different Chinese characters, though the pronunciation for each remains kaku. Moreover, the modern verb for “to draw,” egaku, regardless of how it is written, is, etymologically, simply a combination of the word e (picture) and kaku, i.e. to write/draw/paint a picture. The individual sheets are both hand-painted and mass produced, though the number of copies was quite limited, meaning there are rather significant variations among existing scrolls. The artists who participated in this project all worked for newspapers and magazines, so their work was generally seen in print, but they were also, as was common with [manga] artists of early modern Japan, trained as painters, so the contradictions inherent in the manga emaki are symptomatic of the seeming contradictions in the professional histories of the artists themselves. The shin (“new”) in the title of Ippei’s book could be taken either with manga (thus “new [manga]”) specifically or with the entire phrase manga no kakikata (thus “the new how to draw [manga]”), and it is in the latter sense that I have most often seen it translated. However, the adjective (atarashiki, “new”) that begins title of the first section Atarashiki manga no kakikata can really only modify the word that immediately follows (manga). Given that and the sense of what [manga] is in Ippei’s text, I have preferred How to Draw the New Manga here. [M]anga no hō de wa onna ga hana ni tai shite arui wa senchimentaru de arisugiru ka, arui wa mukanshin de arisugiru ka in Ippei zenshū vol. 13 p. 10. [J]iyū ni kansatsu shite jiyū ni egaku tokoro no e, ibid. p. 9. 43. Why Do Scanlations Persist?